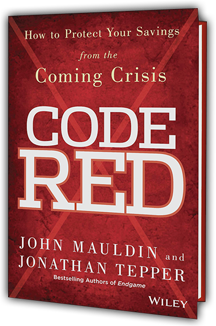 I had the opportunity over the past few weeks to read John Mauldin's new book Code Red. The book is far and away the best finance and economics book released this year. It provides a phenomenal background on how we got here with central bank policies, the impact on the markets today and how we will move forward in the future. There are chapters on Japan, leading economic indicators and previous Fed forecasts. Mauldin walks through the reasons why quantitative easing programs are not helping the real economy, and why they are boosting paper asset prices (a topic I discussed briefly in How Quantitative Easing Raises Stock Prices & Why Stock Prices Will Fall). The following is an excellent interview with Mauldin and Steve Forbes discussing a few of the topics found within the book, which should be at the top of your list if you have some reading time during the holidays.